Known as スーパーロボット大戦 or Super Robot Taisen in Japanese, this franchise goes back to rather ancient gaming times and continues haltingly into the modern era. What The Heck Is A Super Robot? For Americans and other non-Japanese, let me explain this in terms that should be easy to understand. In other words, not realistic. As in, a realistic robot, not a “real world” robot! This is Super Robot 101. Western gamers shorten this to the acronym SRW, and to save time and ease reading, I will do so as well. For the Japanese anime aware, yes, I am WELL AWARE that the above are “GoLion” and “Valkyrie Fighter” in the Japanese versions. Who do you think I am?… But to explain to the uninitiated, such departures are necessary. All but extremely limited and rare offshoots of these games are turn-based strategy games involving statistical formulas and player strategy as one army faces off against one (or more) opposing armies. Rather than purely men (and women), these battles are fought with mecha, which is Japanese jargon for a machine (from: mechanical). The single great defining feature of the series, however, is that it is an anime crossover game series. By crossover, I mean that the games draw upon characters (and mecha) from a diverse cross-section of mecha anime, ranging from the realistic (i.e. Gundam) to the apocalyptic and incredible (i.e. Evangelion). Essentially, I eat these games for breakfast. SRW games are one most challenging type of games in existence for he (or she) who wishes to read Japanese natively. The dialog ranges from the ridiculous, to the insanely colloquial, to the extremely technical, including specialized military jargon. Through it all, the language is peppered with loan words. Well, it took me a long time to get up to the speed required for them, but it is nonetheless one way I keep my unconventional reading and listening skills sharp. 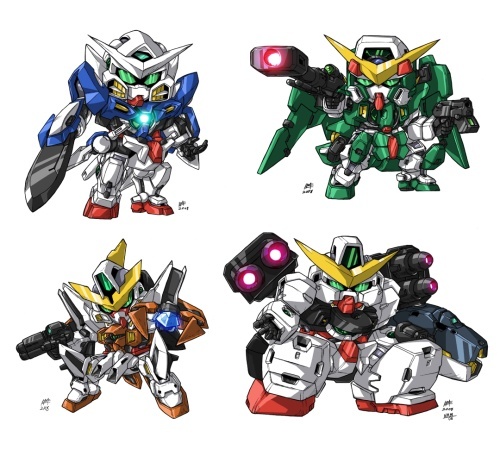 As you can see from the picture, mecha in the “super deformed” style is basically… big head, squished body, which creates a “deformed” body style. 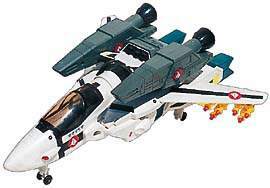 Originally, the use of SD (Super-Deformed) mecha was because the primitive systems SRW games were on had to be this way to fit within memory constraints. Later, it became an issue of economics: studios like Sunrise (creator of Gundam and many other franchises) license SD likenesses of its properties at half the price of full size versions (or so I have heard). Thus, by using SD models, the creator (Banpresto, derived from Bandai, the toy company behemoth) can unleash a massive army of mecha, and their associated characters, upon a large niche gaming market. Thanks to licensing hell from so many varied properties, the legal challenges of bringing these games to North America have scared everyone off from even trying, except for one. Original Generations uses the Banpresto “original” (i.e. not appearing in an outside created anime) characters, which means Banpresto owns all the rights, which means, no licensing hell. However, only the Nintendo Gameboy series versions (mainly for the dual screen version, or NDS) have been brought to America. A PS2 version mashing together Original Generation 1 & 2 was released in Japan. I own that game, and it’s not bad. Anyway, we can no longer say that originals haven’t appeared in anime. That’s what the Original Generations anime, seasons 1 and 2, are all about, based on the first and second games, respectively. 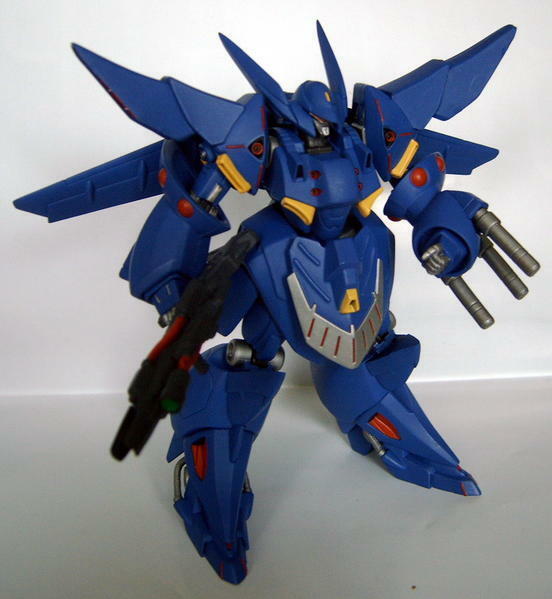 The image at the top of this article is a Gespenst, one of the oldest “original” mecha used in the SRW series. Besides the encyclopedic data in the games themselves (and I’m not kidding – there’s an in-game mecha and character encyclopedia in every console version dating years back), there’s a huge amount of in-game dialog, particularly during battle animations where the results of the statistical foolery play out before your eyes with background music (BGM, BGM’s) playing and voice actors (seiyuu) speaking these lines as they appear at the bottom of the screen. In ancient console versions, and all portable ones, this written text is all you get, but for console versions – including ports – you get voice, too. The sheer entertainment value of this is incredible, even if the general technology level of these games is at the lower end of the scale in general. Essentially, SRW is a gateway drug to more mecha anime, and introduced me, personally, and quite a lot of gamers to anime which they have not seen before, but would like to (largely as a result of seeing the content in these games). The reason I write these words is so that, in the future, I can simply link back to this post and people can get an explanation of what the broader subject is when I discuss, oh, “and in SRW Z, this unit is great to use) or something like that. Put bluntly, I am capable of an embarrassingly large degree of highly detailed babble about things arising in this game series, and relating to anime appearing in these games, that I wanted to give people some kind of heads up about it. At any rate, there’s an incredible amount of non-traditional language education that can be derived from my gaming, and rapid-fire reading, experience gleaned from these games, and that has value to me as a blogger. This entry was posted in Culture, Japan, video games, Weird Stuff and tagged culture, gaming, Japan, mecha, OG, Original Generations, SRW, suparobo, Super Robot Taisen, Super Robot Wars, video games, スパロボ. Bookmark the permalink.